The Eiheiji (temple of Great Peace) is located in the mountains of Fukui Prefecture about six hours train ride from the old capital of Kyoto. This temple was founded in 1244 by Dogen Zenji, one of the outstanding personalities of Japanese Buddhism and one of Japan's great philosophers. He was born in the year 1200 of aristocratic parents. At the age of nine he is said to have read the Chinese translation of Vasubandhu's Abhidharma-kosa-sastra (a Sanskrit text of 30 volumes) and at 14 to have been ordained at the Hiei Monastery in Kyoto. After some years of study in the temples of Kyoto, he felt the need of a new master and left Japan for China where he finally became the disciple of the Zen monk, Ju-tsing. Under this master he found what he was looking for, and then returned to his own country where he established a temple in the vicinity of Kyoto. 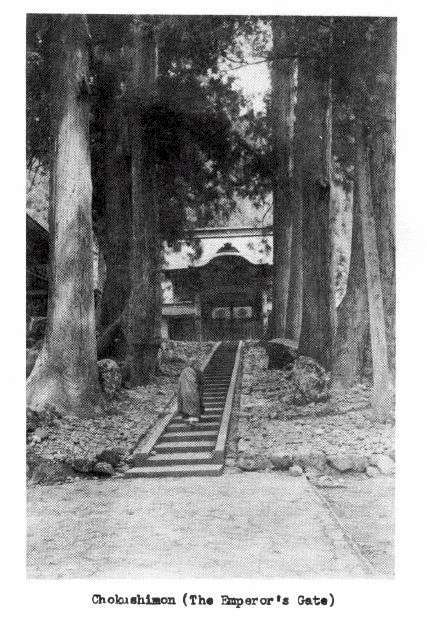 However, the proximity to Kyoto had many disadvantages and wishing to avoid political involvement, Dogen founded a new temple in remote Echizen no kuni, now Fukui Prefecture. He remained in his Eihei Temple for the rest of his life instructing his disciples and writing prolifically. In his last years the Emperor Gosaga wished to present him with a purple robe. Dogen refused to accept the gift until his relatives in Kyoto, fearing imperial displeasure, finally persuaded him to change his mind. He is said never to have worn the symbol of royal favor: "laughed at by monkeys and cranes, an old man in purple robes." Eiheiji is now one of the two [large] training centers for priests and ordained laymen of the Soto Zen sect of Buddhism. 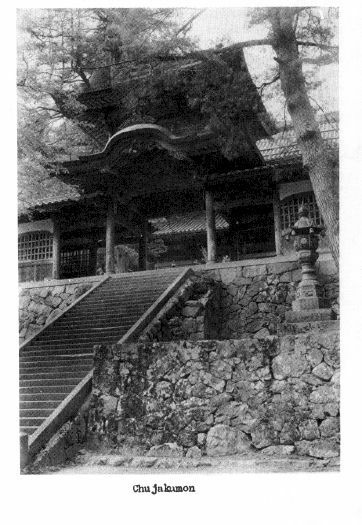 The temple is perched on the side of a mountain and surrounded by giant cryptomeria. In winter it is engulfed in 6 or 7 feet of snow. The sun is rarely seen for a whole day at any time of the year; heavy fog and rain drift up from the Japan Sea. The rocks and the black trunks of the cryptomeria are covered with heavy dark green moss and the temple compound is blanketed with this flourishing vegetation. The monks tend it carefully, weeding out small plants and grass. From April till early December the sound of rushing water can be heard throughout the temple compound through which flow a number of mountain streams that break and fall just below the main entrance. Eiheiji comprises 14 large buildings as well as guest quarters and numerous smaller buildings. These are joined by long covered passages. The floors of these passages are so highly polished that one must take great care not to fall as one pads up and down the endless stairs in floppy felt slippers. Monks and guests all leave their shoes in a small building next to the main gate. Inside the sammon (main gate) are two tall plaques bearing characters which mean: "only those concerned with the problem of life and death should enter here. Those not completely concerned with this problem have no reason to pass this gate." In the spring and in the autumn, those who wish to be accepted as novices, arrive in their traditional costume which includes a big bamboo hat, a short, full skirted black robe and white leggings. An applicant first prostrates himself three times and then announces his arrival by whacking a small wooden gong with a wooden mallet. He is first led to a small room (sappir) where he is told to sit in the cross legged position called the lotus position. Here he must remain until one of the senior monks comes to interview him 6 or 7 hours later. "Why have you come to this temple?" one young novice is asked. "To meet the founder (Dogen) face to face" (to learn his teaching) replies the novice. Then he is asked, "how should this be done?" "I think by forgetting oneself," he replies. Then he is asked, "What was written inside the sammon?" The novice cannot remember and the senior monk asks, "do you always enter places when you don't know what lies within? --- The founder's teachings can be studied in your home temple; to take the trouble to come here to this main temple was unnecessary. Those who do not see and comprehend what is written inside the sammon cannot understand the teaching. To learn about Buddhism is to learn about oneself, to learn about oneself is to forget oneself." Another applicant is asked, "why didn't you come here sooner?" "I had business to take care of and my father was sick," replies the novice. "I am waiting to hear the reason," is the sharp reply. A third novice, when asked for his reason for coming, answers, "I wish to receive the training of this temple." "There is none of that kind of training here," he is told and he is taken by the scruff of the neck and put out of the room. "Daily life is none other than the way." The novice's first task after his interview may be to wash the lavatory floor. 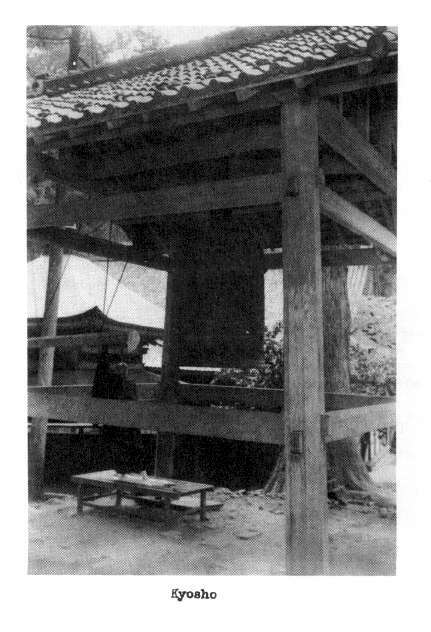 After a gassho (palms joined in the attitude of prayer and head bowed), before the small shrine near the entrance, he ties up his long sleeves, dons wooden geta (a kind of wooden sandal) and proceeds to wash up as quickly and efficiently as possible under the watchful eye of the senior monk. This task preceded by the gesture of gassho is a more significant part of the monk's life than any of the colorful and impressive ceremonies performed in the temple. In the gassho the left hand symbolizes the heart (Buddha nature) of the greeter or one venerating, and the right hand thsze greeted or venerated. Monks greet each other and guests; and venerate the Buddha's images in this way. At Eiheiji the gassho is also please, thank you and excuse me. It is used by the monks before many of the most menial of their tasks in the spirit of the Chinese Zen poet P'ang-yun, "Miraculous power and marvelous activity- -Drawing water and hewing wood!" The gassho is truly an attitude towards life. When this gesture is made quite spontaneously and automatically before a hot bath or a cup of tea; before going to the toilet; in time of pain or sorrow, then the way of the Buddha has taken its first step beyond philosophy. The Samu (manual labor) of the Eiheiji monk is not a mortification. It is not a disagreeable, but a necessary means to a desirable end. Samu combined with Zazen (meditation in the cross legged position) stimulates an omnipresent WHY which is the center of Zen life. The answer to this WHY cannot be grasped by logic; it cannot be apprehended through ritual and the Zen master cannot give his disciples the answer. He can only help them to find it for themselves. When a Zen monk knows the answer to the Zen question, as he knows his own breathing; when he has become the answer itself, his temple and his master have no more to teach him. In Rinzai Zen which was introduced to the West by Dr. Suzuki, the Zen master helps his disciples to answer this WHY by posing koans or problems which cannot be solved by reason. As, for example, "who were you before your father and mother conceived you?" These koans are meditated on during zazen. The koan is not used in this way at Eiheiji. Rinzai koans are usually taken from the Japanese or Chinese classics. The Soto koan is life itself. Soto Zazen is called ku-hu zazen, or the zazen in which one struggles by oneself. The Eiheiji Zen master is always available and ready to answer the monk's questions. * However, the answers of the master are not a source of comfort but of frustration. A typical response is a pleasant smile and the reply, "be grateful." Ordinarily gratitude means appreciation for benefits received. However, the Zen master's "grateful" is not gratitude for any special thing or things. It is based not on discrimination but on awareness. The monk's regime is oriented to stimulate this awareness. Many small details of everyday life, which ordinarily are so automatic that they have no experiential content, are formalized or ritualized and long hours of sitting in Zazen provide plenty of opportunity to become thoroughly aware of the interrelationship of mind and body, the self and others, humanity and other forms of life, active or quiescent. The Rinzai masters, for very good psychological reasons, tend to hustle their followers beyond value judgments in order to achieve the desired end of a Satori (Enlightenment) experience. For equally good psychological reasons, Dogen decided that the means being inherent in the end, the developing awareness which is not shared spontaneously is not a Buddhist form of Zen (more strictly speaking, not a Mahayana form of Zen). It is difficult for Westerners to understand the function of ritual in such a system. A British Buddhist has suggested that perhaps chanting puts one in the mood for Satori. Chanting is not only an expression of the pleasure of Zazen but it also contributes to this same pleasure. Zazen at first, is a difficult physical, emotional and mental discipline. However, as the ego relaxes its machinations, the practice becomes pleasure itself. In order to chant well, one must breathe properly from the abdomen, and proper breathing is essential to meditation which is the sine qua non of Zen. Chanting a dharani is one of the best ways of emptying the mind of trivia; of settling and concentrating mind and body. Buddhist dharani are Tang or Sung Chinese transliterations of Sanskrit originals which have about the same meaning as hallelujah, hallelujah. Simple people have often considered them magic formulae. That they have certain powers is undeniable--so do aspirin pills. The Eiheiji chanting is the simplest possible form of musical expression. It is not discursive; it does not appeal to the mind and emotions and draw them into interesting involvements. In Buddhist chanting the voice should flow naturally and easily from its source. It is said that monks who wished to learn to chant properly used to stand in front of a water fall and try to make their voices heard above the sound of the water. If the voice came from the throat or chest; if the individual didn't have his mind and body in order, exhaustion was the almost immediate result. However, if mind and body were composed, the sound could flow forth freely and even after long periods of vocal exercise no fatigue would he felt. Christian music, like Christian thought and emotion, attempts to soar to attain the heights of the supernatural. Buddhist music finds its source in the wellsprings of being itself; bringing up from that source peace, vitality and a realization of completeness. An over stimulated ego with its involved system of enervating defense mechanisms produces anxiety, insecurity and restlessness in modern man which make it difficult for him to really listen to the sound of the wind, the sound of the ocean or music which does not express itself in a variety of alternately exciting and pacifying rhythms and tonal changes. The wind, the ocean and the chanting are not really heard unless they are seen with the ears and heard with the whole body. Westerners usually tire quickly of a monotone. Unfortunately, boredom is an escape mechanism which separates man from himself and from that which unites him with the rest of creation. The most important function of the Soto ritual is that it provides a contact with the laymen. The Soto sect undertakes a certain amount of social work including a middle school, a high school and a junior college for girls, a hospital, an orphanage and a day nursery. These institutions are projects of the big Soji Temple in Yokohama and the Eiheiji has no part in their operation. At Eiheiji the only contact with laymen is with those who come to the temple for a night, a meal or for one of the special observances such as the memorial week in honor of the founder and the ordination ceremony for laymen, which are held once a year. The guest quarters at Eiheiji are very large; they are modern, clean and comfortable. The guests live in traditional style Japanese rooms with cushions to sit on; a hibachi (a large pottery charcoal brazier) in which is a tetsubin (iron teapot) for boiling water for tea and a tea set. In one corner is the tokonoma, a special raised platform on which is usually placed a porcelain bowl and above it hangs a kakemono, or scroll. At the Eiheiji the scrolls are usually Sho (Calligraphy). In some of the rooms the fusuma (paper-doors) are also decorated with ink sketches; bamboo and birds being the preferred subjects. The guests are waited on by the monks; meals are served in each room and the futon (sleeping quilts) are brought out every night and put away each morning by a monk attendant. These attentions, as well as the various ceremonies conducted in the temple are a form of eko. Eko roughly translated, means turn direction but Westerners understand its meaning better when it is called sharing. The Soto monk is expected to share his life with all who come to the temple. Even the simplest Japanese peasant is aesthetically oriented and most Japanese have a rather developed intuition. Particularly if they know how to chant the sutras they are able to share, in a rather deep sense, the benefits of the monks' meditations. This is as much a physical as a mental thing. I once discussed the matter with an opera singer who attributed it to what she called an impulse. At the Eiheiji one might say that this impulse has been heeded through 700 years of uninterrupted dedication. The sustained striving of those who have lived in this temple (average stay for ordinary monks 1-3 years, for temple officials 3-25 years) has created an atmosphere that has a climate of its own, a climate which would fail to affect only the very self centered or insensitive. At Eiheiji a typical day begins at 3:30 o'clock in the morning. On days when there is no early morning Zazen, the day begins at 4:30. From the Sodo a big building where the monks live, come the sounds of the time-telling drum and gong. About a half an hour later, two monks run through all the temple buildings ringing shinrei (small hand bells resembling western dinner bells). This is followed by the great bronze bell below the Sammon. About an hour later the guests shuffle up to the Hatto (main building) to attend the morning ceremony. The song of the cuckoo and the cicada soon merge into the waves of chanting and the deep voice of the mokugyo (a large polished wooden drum which is struck with a padded stick) sending waves of deep soft sound down the mountainside. The sutras are chanted in chorus by all the monks and are followed by an eko Here eko means dedication. The order and choice of sutras varies somewhat each morning; but, usually chanted is the important San-do-kai This Chinese poem was written by Hsi-ch'ien (700-790) and is composed of 44 character lines. This style was very popular in the Tang and Sung Dynasties. San-do-kai may be translated as "The Union of the Spiritual and Phenomenal Worlds." "Those who attain enlightenment meet the Shakamuni Buddha face to face, The teachings of the Masters of the South and North are but different expressions of the same thing--the awakened mind returns to the source. Clinging to reason will not produce Satori. When they enter the gates of the senses, interdependent phenomena appear unrelated. Phenomena are interdependent and, furthermore, interpenetration takes place. If there was no interpenetration, there would be no escape from differentiation. The characteristics of form are different; pleasure and suffering appear unrelated. For the unawakened, only duality is apparent. All differentiations arise from the same origin. All expressions describe the same reality. In the phenomenal world there is enlightenment. In enlightenment can be found the phenomenal world. The two cannot be separated; they intermingle and depend on each other. The morning ceremony always includes the recitation of the Dai-osho, or names of the great teachers. According to the Zen tradition, an understanding of the Buddhist Dharma or teaching has passed from mind to mind since the time of the Gautama Buddha. It is said that one day, when seated amongst his disciples, the Buddha held up a flower. His disciple, Kasyapa looked at the flower and smiled. The patriarchs of Zen (some mythical and some historical) beginning with Kasyapa, are venerated as well as a number of mythical Buddhas and Bodhisattvas, symbols of Wisdom, Compassion and other Buddhist virtues. The morning ceremony usually includes the Dai-hi-shin Dharani or Dharani in praise of Avalokitesvara, or the impulse of Compassion. This Dharani is chanted with mokugyo at a rather fast tempo, and the surge of vitality from the figures, seated cross legged and immobile on the tatami (straw) matted floor is very compelling. The ceremony almost always concludes with the Myohorengekyo (Sadharma Pundarika Sutra) Juryobonge (Chap. 16) which extols the value of sharing the Buddha's teaching. As one leaves the Hatto (main hall) after this ceremony, the dawn is arising from behind the distant hills. Most of the monk's day is spent doing samu. Even the old kannin himself does some form of manual work. The monks clean the temple, bring wood to the kitchen, make charcoal and wait on the guests. Several times a year they have Sesshin or periods in which to "collect the mind." During Sesshin nearly all the monks spend the whole day in the Sodo doing Zazen from 2 or 3:00 in the morning till nine at night. During the Sesshin periods the food is both good and plentiful. Ordinarily, the monks live on watery rice and a few equally watery vegetables. The visitor's day may be spent taking walks in the lovely countryside around the temple, drinking tea with the senior monks when they are free or asking the Zen Master for instruction in Zazen. If sleepy from early rising one simply curls up like a cat on the tatami floor of one's room for a nap. The tatami are clean and beautiful and smell of sun and fields. The food served to the visitor is called shojin--ryori and is completely vegetarian. However, Eiheiji's cook is a master of his art and, even when the number of visitors is large, the food is varied and good. It is served on lacquer trays in many little lacquer dishes and includes such specialties as lotus buds in syrup and tiny oak leaves fried in deep fat. Life is very comfortable for a western visitor if he can sit comfortably on his heels for long periods, doesn't mind shaving in cold water and likes rice, pickles and cold spinach with soy sauce for breakfast. Each meal is preceded by a grace which the monk who serves it chants for those who don't know it. The day ends with a Japanese style bath which is one of the real delights of Japanese life. Outside the bathroom is an anteroom where one leaves one's clothes and makes a gassho and lights a stick of incense and places it in a tiny brass dish in front of a little plaque on which are characters which mean, "sweet smelling water." The bathroom is a large tiled room in which is a big square tub with a seat at each end. First one soaps, and then rinses with water which must be taken from the tub in a small wooden box. After this procedure, one clambers into the tub and soaks in the steaming water for a while. After the bath, one may take a cold shower and then return to one's room, feeling quite ready for sleep. One night I passed a room where the Shoji was just slightly ajar. Inside, a tiny little old woman with a shaven head and wearing very worn black cotton nun's robes was sitting on her heels in front of her hibachi. She was sitting completely motionless. It was impossible to tell whether she was asleep or awake. Her work swollen hands were joined in a gassho and on her thin wrinkled face was what one art critic has called the archaic smile, the enigmatic smile of the sphinx, the dancing Shiva; the stone Buddhas of Tang, the Mona Lisa, the smile of Maha Kashapa; in that serene smile of the little old nun -- wisdom of the Buddhas and the Patriarchs, the wisdom which cannot be taught; but can be found and embodied. The material on these two discs has been taken from tape recordings of about fourteen hours length. Needless to say, almost none of the ceremonies could be included in entirety, nor could any bell or gong sequence be retained in its original length. However, all the sounds and ceremonies heard on a typical day in the temple are represented. As for the order of the material, this has been kept as accurate as possible. Most of the recordings were made over a period of about a week in September of 1957; however, several ceremonies were recorded two years later. Some of the difficulties involved in accurately documenting a typical day were that first of all, in such a large temple several ceremonies may be carried on simultaneously and, secondly, special ceremonies, which are a regular part of the temple life, are performed at different times of the month and a typical day would probably not include more than two or three of such ceremonies. The listener may wonder why we have included repetitions of certain sutras and particularly dharanis. The reason for this is that though many of the sutras and scriptures chanted are carefully studied by both priests and scholarly lay adherents, their use in ritual is not to teach conceptually; but to create a certain kind of atmosphere. This atmosphere is only incidentally aesthetic in quality. It is the state of mind which is important. Ceremonies are not meant to hypnotize the participants into apathy. The mind should become quiet, clear and receptive, so that it may know what is beyond concepts and beneath activity. In this experience mind and body must both participate. Nor is ritual meant to provide a special time and place for the experience in question. A ceremony should be an extension of Zazen; as is washing the lavatory, weeding the garden and attending to the wants of visitors. Though a monk removes his muddy samu (work) suit and puts on a silk robe before participating in a ceremony, his frame of mind is meant to remain the same as in his Zazen. Record I side I begins with the time-telling drum and gong (koten). The drum announces the hour and the gong the minutes. This is followed by a small hand bell, similar to a Western dinner bell (shinrei). Next we hear the meditation bell (kyosho). This bell (o bon sho) hangs in its own special housing just below the main gate (sammon). It is rung during the 45 minute meditation period; forty five minutes is the length of time it takes to burn one incense stick (senko). In the background can be heard cicadas; the voice of a cuckoo and the rush of water flowing down the mountain side. The novices live in a large wooden building called the sodo (see diagram) [? - there's a photo in the sodo on p.12]. Inside the sodo are raised platforms (tan) which are covered with rice-straw (tatami) mats 6 feet in length by three feet in width. Each monk is provided with the space of one tatami mat where he eats, sleeps and meditates. Outside the main hall of the sodo is a rather wide corridor, on one side of which is one long tan. Only monks living in the temple may enter the main hall, the adjoining corridor accommodates postulant novices, visiting monks and lay people (for meditation only). Also in this corridor there is a very large drum on a stand (sodoku) a small bell (sodosho) and a very large wooden gong in the shape of a fish (Ho) * as well as a small wooden board which, like the aforementioned bell and gong, is hit with a wooden mallet. * Probably symbolizes constant wakefulness and perseverance. After the chanting for the kesa, we proceed to the Hatto (teaching hall) for the morning ceremony. This ceremony (Choka) is announced by a small bronze bell (densho) which hangs outside one of the entrances. The Hatto is a very large tatami-floored building, which is used for all important services. 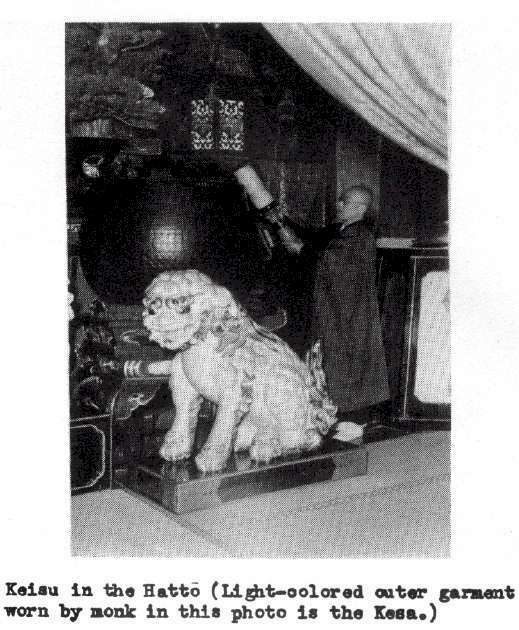 The morning ceremony begins with the chanting of the Hannya Shingyo (see p. 9). 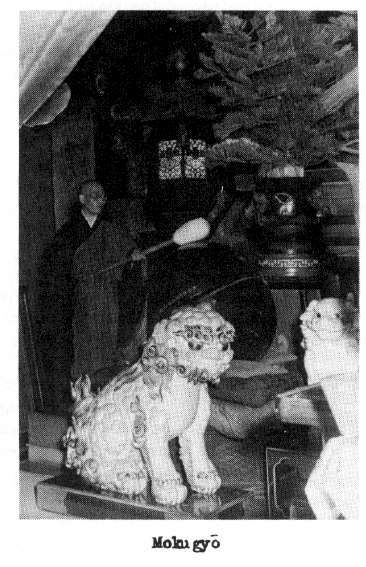 The chanting is accompanied by a large bronze instrument called a keisu (see photo p. 7). Following the Hannya Shingyo, we hear the San Do Kai (see p. 11); eko; (which includes a recitation of the Dai Osho (p 12) * and the Juryobonge, the translation of which is too long to be included in this booklet. Occasionally during the ceremony, the dawn drum (gyoku) can be heard in the background. Also, in the beginning of the Hannya Shingyo one can hear the cuckoo and cicada. *At the beginning of the chanting of the Dai Osho, a small keisu is struck several times with an unpadded stick, as in the Fusatsu ceremony. 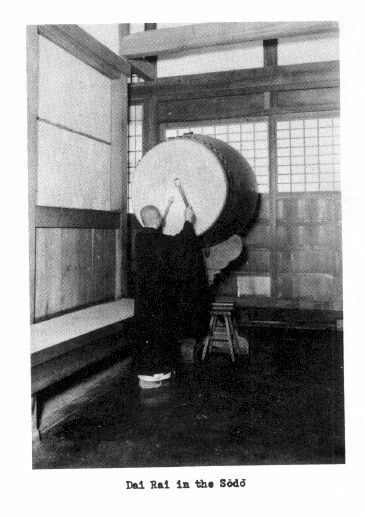 The second side of the first record begins with a bell (densho) which is followed by two wooden gongs (ho and kairoban); a gong (arhatsuban); wooden clappers (kaishaku); and a drum (dai rai), These sounds indicate the preparation for breakfast. The food is taken from the kitchen to the sodo (except when the monks eat in the hall just outside the kitchen). Punctuated by the clappers we hear the verses for eating (Jikiji-ho) (see p. 10). The dai rai is heard again after the first part of the Jikiji-ho. Ordinarily this drum just precedes the breakfast. During this time an offering is made to the Monju Bodhisattva (symbol of wisdom) who is enshrined in the center of the sodo Before the sound of the drum, you will hear a clock striking in the background. After the "thunder drum" (dai rai) the wooden clappers are heard and the chanting for eating continues. During this chanting the monks untie the napkins which contain their eating sets. These consist of a few bowls and chopsticks. After the chanting, the food is dished out of big wooden pails by waiter monks. In the background can be heard the sound of doors being opened and closed, as well as footsteps. The next ceremony is a special one held in the Joyoden or shrine of the founder (Dogen Zengi) on the fifteenth of each month. First the bell (densho) announcing the ceremony is heard. While this bell is being rung the monks file into the Joyoden. The latter is a rather small building with a stone floor. Lay people do not usually enter this building during ceremonies. After the bell we hear the Dai Hi Shin Dharani (for a translation, see Suzuki "Manual of Zen Buddhism" p. 22) which is accompanied by the mokugyo. The Dharani is followed by an eko and the refrain ''Jiho sanshi ishi fu; Shison busa mokosa, moko hoja horomi" ( Homage to all Enlightened ones, past, present and future, everywhere; to the many Bodhisattva Mahasattvas; to the maka-prajna paramita). The next ceremony is perhaps the most appreciated by the monks. It takes place twice a month (15th and 30th or 31st day) and is called Ryaku Fusatsu. It is held in the Butsuden (shrine of Shakyamuni). We hear short portions of this ceremony beginning with ''Namu Shakamuni Butsu" (Homage to the Shakyamuni Buddha). This is followed by the vow of the Bodhisattva ("Shiguseigan" see p. 10). After the Fusatsu, we hear the last part of the Hannya Shingyo accompanied by the mokugyo and keisu. The ceremony for the 500 Enlightened Ones (Skt. Arhat) is also held on the 15th of each month. It takes place in the room above the main gate (sammon). The room in which this ceremony is held is rather small and the acoustics are not very good. Side two of this record ends with the midday service which is held in the Butsuden. It begins with the striking of the keisu and continues with the Buchyo Sonsho Dharani (Dharani of the Victorious Buddha Crown) * which is accompanied by the mokugyo. The listener may sometimes notice lulls in the chanting. Also, when there is no keisu or mokugyo to regulate the tempo, the waves of sound roll and break over each other at rather irregular intervals. This is considered quite natural. * Suzuki , Manual of Zen Buddhism, p. 23. Record two, side I begins with the deep tones of the keisu in the Hatto. This announces the beginning of "the Fire Protection Ceremony", from which we hear part of the Juryobon. Fire protection ceremonies are held in all Japanese temples and shrines (Buddhist and Shinto). Fire is an omnipresent hazard as the buildings contain many inflammable materials. Temples and houses, originally built hundreds of years ago, may have burned to the ground many times during the course of their existence. As many times as they are destroyed, they are rebuilt, usually in the same style and in the same place. Buddhist philosophy does not condone petitionary prayer or any attempt to cajole a supernatural force into watching out for human interests; however, popular Buddhism has accepted and absorbed those indigenous practices which are based on deep seated human hopes and fears. These practices have been gently manipulated and molded to fit harmoniously into the structure of the Buddhist framework. And, it is important to remember that Buddhism teaches that intellection alone is not capable of probing the secrets of the universe. The great mysteries of change; of death and regeneration must be approached differently to be truly apprehended. Following this Dharani there is a short silence and then footsteps are heard. The listener has left the Hatto and entered the kitchen shrine which is somewhat removed from the Hatto In this shrine one young monk chants the Dai Hi Shin Dharani with eko and refrain. *The disciple is whacked several times on one or both shoulders. Before and after the beating, the monk receiving the kyosaku is expected to gasho politely. **In the background can be heard the footsteps of monks walking by the open door and a clock ticking. Monk: "What have you come here for?" Novice: "I have come to show my gratitude (On) for the master's teaching (to learn Dogen's teaching)." Monk: "And how do you intend to go about showing this gratitude?" Novice: "By not clinging to myself, I think." Monk: "That's all right. And do you really intend to persevere to that extent?" (Without waiting for an answer he continues) "What was written on the Sammon?" (silence) "What was written there?" Monk: "Where did you stay last night?" Novice: "In the station in Fukui." Monk: "There is an inn just below the sammon where you could have stayed. Novice: "I intended to come last night but neither the train nor the electric car was running." Monk: "Um! 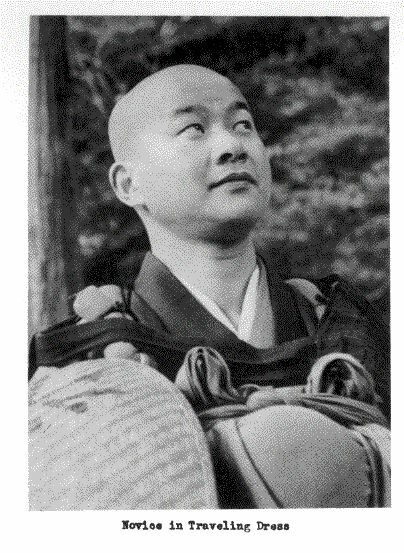 The founder can be served in your home (you can study the teaching, of Dogen in your home)." Monk: "To take the trouble to come to this temple (Hon zan) was unnecessary, wasn't it? It was unnecessary to come here..."
Here we leave the interview. Next we enter a large room with a low ceiling, where about thirty monks are kneeling in front of' long benches on which are placed their sutra books. The chanting leader (Ino) who is seated in front of them at a small desk, is giving instruction in the technique of chanting the shomyo. The shomyo is a verse (Skt. gatha) of praise to the Buddha and, as in Western music, there is a kind of melody. In Zen ceremonies the shomyo is not used very often. This style of chanting is more popular in the Shingon and Tendai sects. The aesthetic principle of yugen is observed in the shomyo. Yugen is very difficult to translate. It suggests the depths of the infinite or the sound of eternal stillness. Yugen points beyond the finite and the transitory to the source of form. In this lesson the ino asks his pupils to chant parts of the shomyo on successively higher pitches. We leave the music lesson and proceed to * the visitor's quarters where we hear a portion of the Jikiji-ho being chanted in one of the guest rooms. These guest rooms are bedrooms at night, at which time the sleeping quilts (futon) are spread on the floor. In the daytime the quilts are removed and the rooms become living and dining rooms. Meals are served here by the monks who bring the food on individual lacquer trays. Before eating one or, in some cases, two monks and the guests chant the Jikiji-ho. ** Memorial service for Dogen's Chinese master, Ju-tsing, held on the 16th of each month. 0n side two of the second record are the last ceremonies of the day, including an evening ceremony and memorial service for the dead (Segaki). *** In the Segaki special instruments are used. There are small bells (inkin), a drum (shoku) suspended from a stand and a large pair of cymbals (nyohachi). The first sutra heard is kanromon (Gate of Immortality) and the second is chapter IV of the Shushogi (Taking vows and the Enlightenment of Beings). This important text (for Soto shu) was written by Dogen. During the chanting a monk can be heard (in the background) telling the lay people when to stand and when to proceed to the altar to make an incense offering. *** An important omission from this selection of daily events is the chanting of the Fukanzazengi which is heard at the end of the evening zazen (yaza). Yaza is field from seven to nine, or from eight till nine P. M.
. . One's appearance may be insignificant, but if the bodhicitta (desire to seek the Truth) is aroused one is a leader of all sentient beings. One may even be a seven year old girl ... in the Buddhas religion no distinction is made between the sexes ... A spiritual gift is a material gift; a material gift is also spiritual. And nothing should be expected in return for what is given.... Beneficial practice means any action which benefits any sentient being. When one sees a tortoise in distress or a sick sparrow, one is prompted to rescue them without expecting anything in return from them.... Self and others are inextricably interrelated and interdependent.... A sea refuses no stream to flow into it .... water when accumulated extends far and deep... In the vows and practices of one who has aroused his mind to Bodhi, such lines of thought should be followed in quiet meditation. While this chanting is going on we leave the Hatto and walk down one of the roofed corridors and then, turning right, ascend the steps which lead to the Joyosho. In front of the Joyoden is the evening bell (konsho) which is rung for a half an hour. In this recording the sound of rain on the tile roof of the corridor can be heard. When we return to the Hatto the monks are chanting Myohorengekyo Fumonbonge (*Chap. 25 of the Myohorengekyo). The evening ceremonies end with the drum, cymbals and inkin which accompany the refrain (Jiho sanshi...). Next we hear the Hatto bell and finally the deep sound of the Keisu. Thus ends another day in the life of the 700 year old temple.